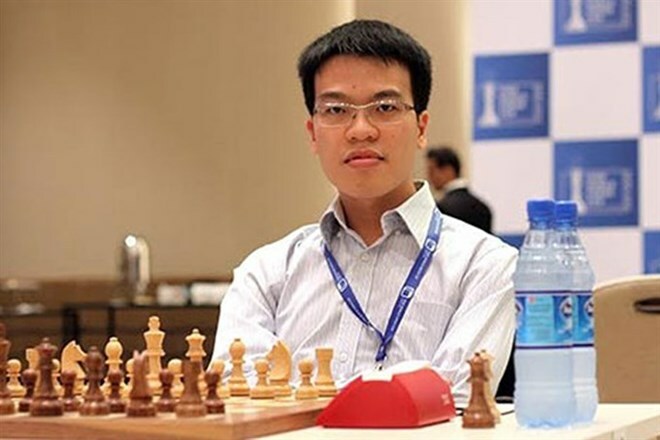 Hanoi (VNA) - Vietnamese top chess player Le Quang Liem had two wins and a loss in the first day of competition at the St. Louis Rapid & Blitz tournament in the United States on August 15 morning. Liem, who has Elo rating of 2739, beat American players Fabiano Caruana (Elo 2807) and Hikaru Nakamura (Elo 2792). However, he was defeated by Sergey Karjakin of Ukraine (Elo 2773), when holding black pawns. With four points after the first three rounds, HCM City-born Liem was tied for the first place, together with Levon Aronian (Elo 2799), Caruana, and Ian Nepomniachtchi (Elo 2751). Liem will compete against Lenier Dominguez of Cuba (2803), Ivan Nepomniachtchi of Russia (2819) and Levon Aronian of Armenia (2799) in the next three matches. The tournament, which is part of the Grand Chess Tour (GCT) system, has a prize money of 150,000 USD.